» North Face Venture 2 vs Resolve 2 – Which is Best in 2019? North Face Venture 2 vs Resolve 2 – Which is Best in 2019? The North Face is a top-tier outdoor apparel brand that has garnered quite the loyal following since its founding in 1968. The North Face, or TNF as they’re often referred to, sprouted up in San Francisco, but is now a worldwide brand favored by outdoor adventurers of all types. TNF is known for being more on the “luxury” end of the outdoor apparel brand spectrum. But don’t let that fool you into thinking that it’s all for the show. TNF gear is truly well-made, designed to last, and can look just as beautiful as casual wear as it is up in the mountains. For many people, TNF is worth every penny for your backpacking adventures, despite their clothing being priced on the higher end of the scale. Bottom Line Up Front (Skip the Chatter): I strongly lean towards the Venture jacket available here. It’s a bit lighter and more “packable” for a marginal increase in price. When it comes to jackets, The North Face has one for every hiking occasion. Perhaps one of the most useful styles of jackets for the average outdoor enthusiast is the classic rain jacket. Whether you’re scaling up the side of a mountain, strolling along a groomed path, or stalking through the woods on the outer after a prize buck the last thing you want to experience is a rainstorm that leaves you soaked in water. 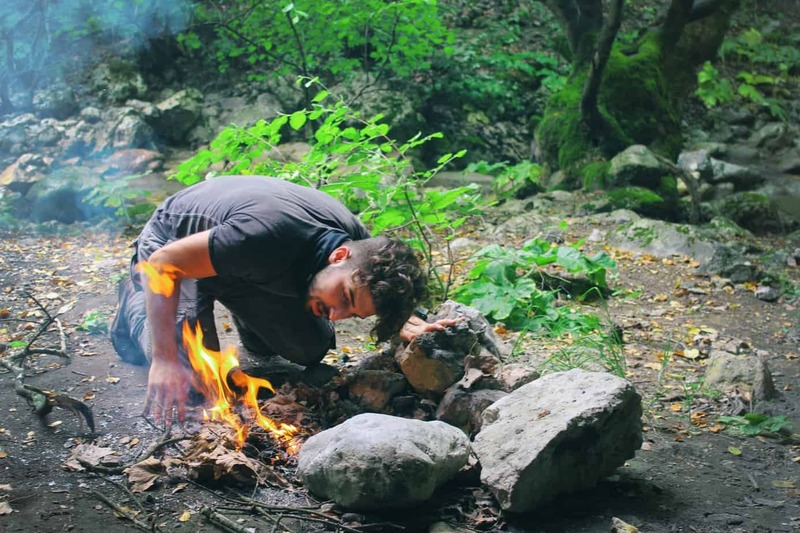 Not only are soaked clothes uncomfortable, but it can quickly turn into a dangerous situation in a cooler weather, so you better keep yourself dry and warm while backpacking. The North Face has plenty of rain jackets or rain shells available – in fact, they have an entire category on their website dedicated to them so you can find the best fit for you. Out of their 26 different rain-appropriate jackets there are two that are at the top of the list – the Venture 2 and the Resolve 2. As the name suggests, both are upgraded models from the originals (which will no longer be produced). If you’re searching for reasonably priced rain jacket from TNF that looks great and keep you protected against rain and water, performs impeccably, and has a few creature comforts, chances are you’ll end up having to decide between these two models. So Which Jacket Should You Buy? Resolve 2 or Venture 2? The TNF Venture 2 is a lightweight, breathable rain jacket that protects from moisture and water as well as wind. This particular model is highly durable in design, provides great comfort thanks to the ripstop nylon exterior. With a relaxed fit and an adjustable hood, you can use the Venture 2 for numerous activities like hiking and backpacking. On the TNF website, you’ll find that the Venture 2 has over 250 reviews and maintains a solid 4.5/5 star rating. Based on ratings, this jacket comes with an impressive 94% recommendation rate from customers. This midweight rain jacket is highly compressible and packable, perfect for the outer. It is unlined and has a relaxed fit, allowing you to layer up under it if the weather is cool to keep you warm. 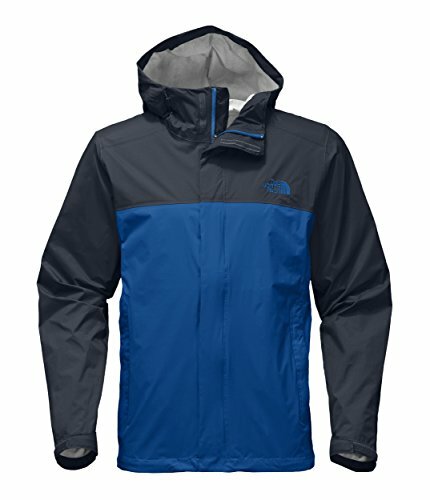 TNF rates this jacket as being resistant to water and wind. 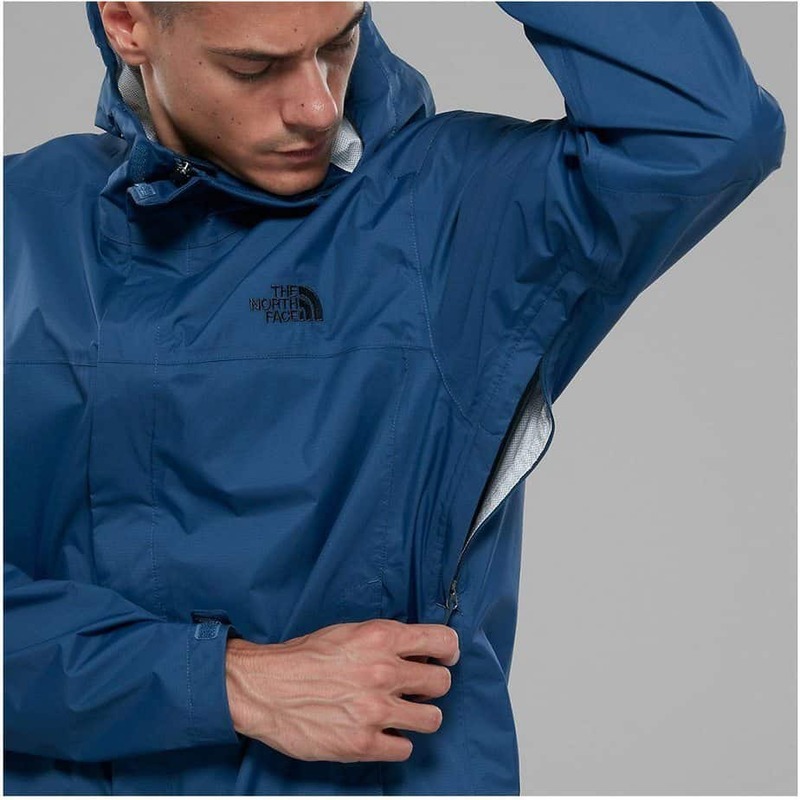 The exterior material is a DryVent coating, which is a TNF technology designed for their rain jacket. DryVent consists of a waterproof PU coating to offer water protection, moisture permeability, and to improve durability. It has a waterproof rating of 25 PSI after 20 washes. Exact weights vary, but you can expect an average of 11.6oz. The center back length is 29″ which is long enough to ensure you stay covered while bending over during hiking. The Venture 2 is more on the no frills side of thing when it comes to jackets, but it still manages to maintain small features that really come in handy compared to basic water repellent rain shells. 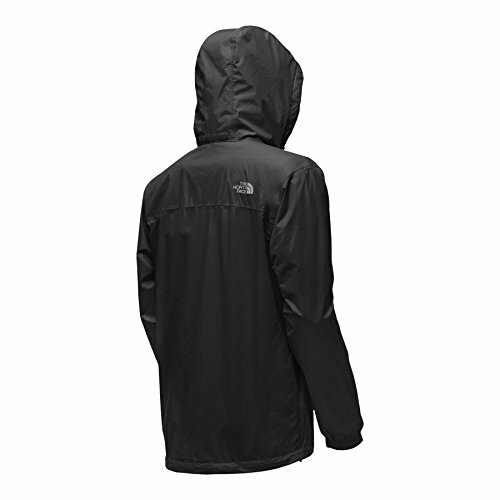 The TNF Resolve 2 is a comfortable waterproof rain jacket with an airy ventilation mesh lining and stowable hood. When it comes to popularity the Resolve 2 is clearly a favorite, having 725 reviews on the TNF website and a 5 star rating. Customers have given this model an impressive 98% recommendation rating. The Resolve 2 is a little bit heavier of a rain jacket, averaging at about 17.3oz. The shell is also DryVent nylon fabric for good ventilation, though 2L rather than the Venture’s 2.5L. The lining is 40D polyester mesh which really helps with breathability and comfort when it’s a little warmer or humid out. The interior lining in the sleeves and hood is soft 75D polyester taffeta and feels great against the skin even during cooler weather. This lightly lined waterproof rain jacket is a great choice for those that want just a little bit of added warmth from their jacket, rather than being purely a waterproof shell coating to layer. It has a little more versatility with the stowable hood, plus the hood is still adjustable like the Venture. Customers clearly love this waterproof jacket. 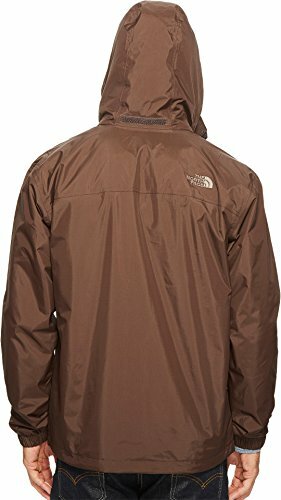 It’s priced perfectly and is great for most types of wet weather uses where a heavier jacket wouldn’t be considered a burden (i.e. camping or short hikes). While these two are great rain jackets to compare, I always like to look at the competitive landscape. Columbia Watertight II: This is another option worth checking out for a very waterproof but also super soft, durable, and comfortable mesh lining. Marmot Minimalist: The Minimalist features a more relaxed fit and – like the name suggests – features just the basics. Patagonia Torrentshell: The Torrentshell is one of Patagonia’s more popular jackets with the key selling point being VERSATILITY. You can wear this alone or as an outerwear shell jacket. These jackets also last forever (excellent durability). Arc’teryx Thorium AR: Another similar hoody jacket, but a bit higher end features (and price point). Although you’ll probably be quite happy with either jacket, there are a couple key differences to keep in mind when stuck between the Venture 2 and the Resolve 2. The two main factors to consider while making your decision in rain jackets are comfort versus functionality. If you tend to do more casual activities outdoor and aren’t planning on doing intensive backpacking or hiking, then you’ll probably find the Resolve 2 to be the better jacket. It is just a little cozier feeling, thanks to the fleece collar. The elastic cuffs and stowable hood add a nice finishing touch to this model. The Resolve 2 is also priced just a tad lower at $90 to $110. Overall the Resolve 2 is an excellent all-around durable rain jacket that is great for hiking and more laidback outdoor activities. Now, if you’re specifically looking for a technical rain jacket or rain shell the Venture 2 is going to be right up your alley. It’s priced just a little higher at $99 to $119, which is not much of a difference. However, with the $9 increase in price, you’ll be getting a lighter weight, more packable rain jacket. Backpackers and hikers needing a lightweight jacket/rain shell to keep stowed in their bag as a precaution will find the Venture 2 to be a much better choice. As an added bonus, the Venture 2 also comes in more color options – including some bright shades (i.e. citronelle green) which could be useful for backcountry adventurers who need added visual safety. Bottom Line: I strongly lean towards the Venture jacket available here. It’s a bit lighter and more “packable” for a marginal increase in price. Further Reading: Best North Face Jackets specifically designed for women.